Is Jefferson Pierce still energized for the fight? Has the Black Lightning TV show been cancelled or renewed for a third season on The CW? The television vulture is watching all the latest cancellation and renewal news, so this page is the place to track the status of Black Lightning, season three. Bookmark it, or subscribe for the latest updates. Remember, the television vulture is watching your shows. Are you? A The CW superhero drama, Black Lightning stars Cress Williams, Nafessa Williams, China Anne McClain, James Remar, Damon Gupton, Christine Adams, and Marvin Jones III. The CW superhero drama centers on Jefferson Pierce (Cress Williams). While he once waged a vigilante war against crime — using the masked persona “Black Lightning”— Pierce retired years ago and now serves as the principal of a charter high school. Endowed with the amazing ability to harness and control electricity, Black Lightning jumped back into action when his city was overrun with crime and corruption. Now it stands a fighting chance, but his family may well pay the price. The second season of Black Lightning averaged a 0.30 rating in the 18-49 demographic and 963,000 million viewers. Compared to season one, it is down by 47% and 44%, respectively. Learn how Black Lightning stacks up against the other CW TV shows. On January 31, 2019, Black Lightning was renewed for a third season. Stay tuned for further updates. Will The CW cancel or renew Black Lightning for season three? I expect it will get a third season but the numbers aren’t great. I’ll keep an eye on the Nielsens and update this page as more information rolls in. Subscribe for free updates on any Black Lightning cancellation or renewal news. **1/31/2019 Status Update: Black Lightning has been renewed for season three on The CW. Details here. TV show ratings are still important. Follow Black Lightning‘s weekly ups and downs. Find more Black Lightning TV series news or other CW TV show news. What do you think? Are you glad that the Black Lightning TV show has been renewed for season three? How many seasons would you like this CW TV series to run? 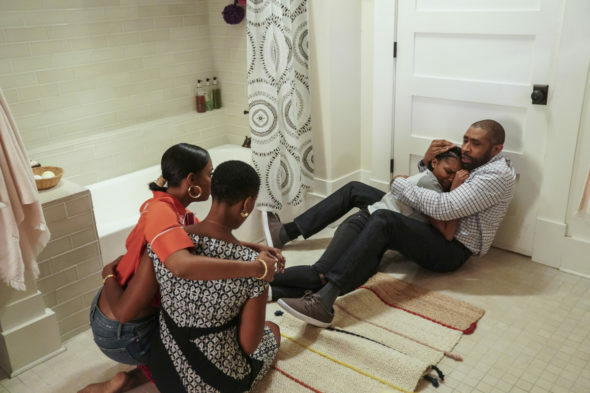 More about: Black Lightning, Black Lightning: canceled or renewed?, Black Lightning: ratings, The CW TV shows: canceled or renewed? please do not cancel this show. it is amazing and needs to be given a fighting chance. the cast is amazing. its very rare you see a black superhero family portrayed in a good way. its very rare nowadays that you see a black family on television at all other than blackish. give us a chance will ya!!!!! Black lighting is all that me and my kids watch it and love it please make a season three I would deeply appreciate it and I’m quite sure the rest of the fans would to don’t leave us in suspense to no what happened to freeland now that the pod kids are loose. Black lightning took 1st place after all the superhero shows, and i watch them all…..Its very action packed very well writen, the stories are great, the superheroes are great, theirs a very good balance in the show. Each superhero has their moment to shine, each character. I definitely hope their is a continuation of seasons for this show…its phenomenal! Please Renew.. My eyes stay glued to the television when Black Lightning is on. Don’t cancel! Yes please. I love this show, it’s not to many good shows to watch. Renewed!!!!!! I love this show!!!!!! Black Lighting need a season 3 so they can Dr. Polaris as a villain ! Warhog as a villain in season 3!